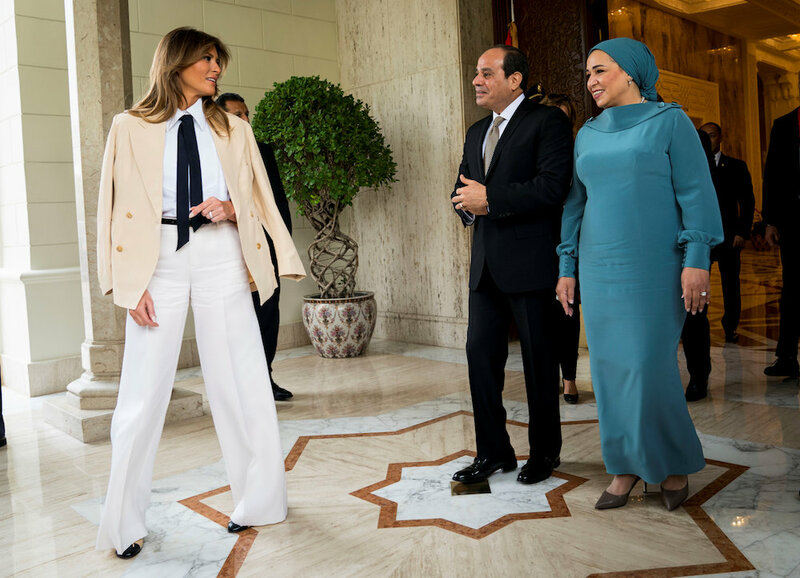 CAIRO: Melania Trump held talks in the Egyptian capital Saturday on the final leg of a solo four-nation tour of Africa that will also see her visit the Pyramids. US first lady’s visit only lasted a few hours but made quite an impact. The visit marked an end to her African tour which started in Ghana and included Malawi and Kenya. This was her first trip alone as the first lady. There were intensive preparations at Cairo airport for her arrival. The streets of the capital were decorated with Egyptian and American flags. Intissar Amer El-Sisi, wife of Egyptian President Abdel Fattah El-Sisi, greeted Melania at Cairo airport. The former model stepped off a plane at Cairo international airport wearing high-waisted white pants, a pleated white shirt and a black tie with a beige jacket hung over her shoulders. The Egyptian first lady Intissar Amer El-Sisi, wore an ankle-length blue dress and matching headscarf. The procession passed through the streets of Cairo amid a heavy police presence with officers lining the roads and rooftops all the way to the presidential palace, where she was received by the Egyptian president for an hour. Trump praised the "hospitality” of Egypt, and expressed her admiration and appreciation for the ancient Egyptian civilization and her pride in the friendship between the Egyptian and American peoples, according to a statement by the Egyptian presidency. She also expressed her keenness to promote cooperation between the two countries, especially in the social fields, as an extension of the fruitful partnership between Egypt and the United States. The Egyptian-American talks dealt with a number of areas of cooperation between the two countries, how to coordinate them, and reviewed the Egyptian efforts in developing a number of sectors such as health, education and tourism, in addition to addressing the state's interest in enhancing the role of women in society. During the visit, which coincided with the celebrations of Egypt’s 6 October victory against Israel in the Sinai Peninsula in 1973. Melania then toured the pyramids of Giza accompanied by the Minister of Antiquities Dr. Khaled Al Anani, the Minister of Tourism Dr. Rania Al-Mashat and Dr. Mustafa Waziri, Secretary General of the Supreme Mosque of Antiquities. Photographers had a field day with the glamorously dresses Trump posing in front of the stunning ancient backdrops with a warm evening light. Political analyst Mohamed Al-Ghabari said her visit to Egypt carried several signs. The fact her visit came on the symbolic Oct. 6, means the US administration is still supportive of Egyptian positions regarding the peace treaty with Israel. Her visit also sent “a message to the whole world that Egypt is safe,” and that Egyptian-American relations are at their strongest. Reuters reported that Melania Trump said during the visit that she does not always agree with the wishes of her husband, and she tells him. Sometimes he listens to her, and sometimes not. In Egypt, she made a rare comment to reporters, praising Supreme Court nominee Brett Kavanaugh, who faces sexual assault allegations. 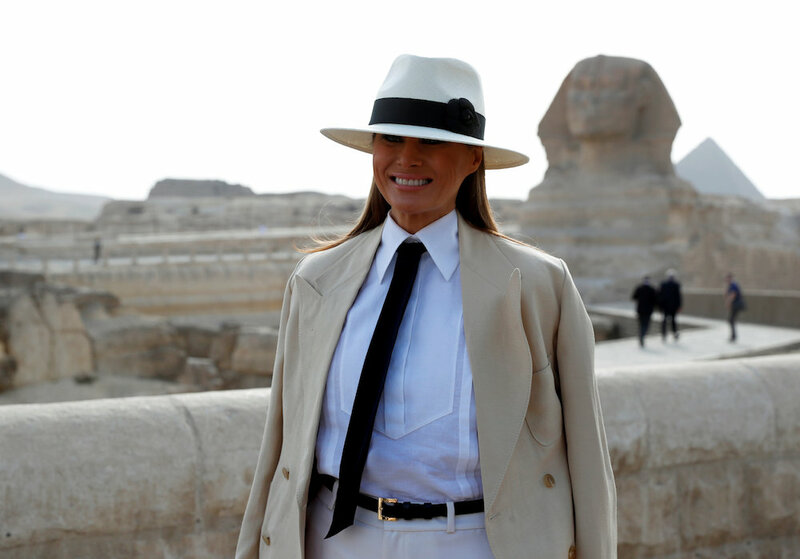 Speaking near the Great Sphinx, the first lady said she was glad he and his accuser had a chance to be heard. "I think he's highly qualified for the Supreme Court," she said. Kavanaugh, who denies the allegation, was confirmed by the Senate as a Supreme Court justice this weekend. Reuters also reported that the first lady hoped everyone would focus on what she was doing and not on the clothes she wore. 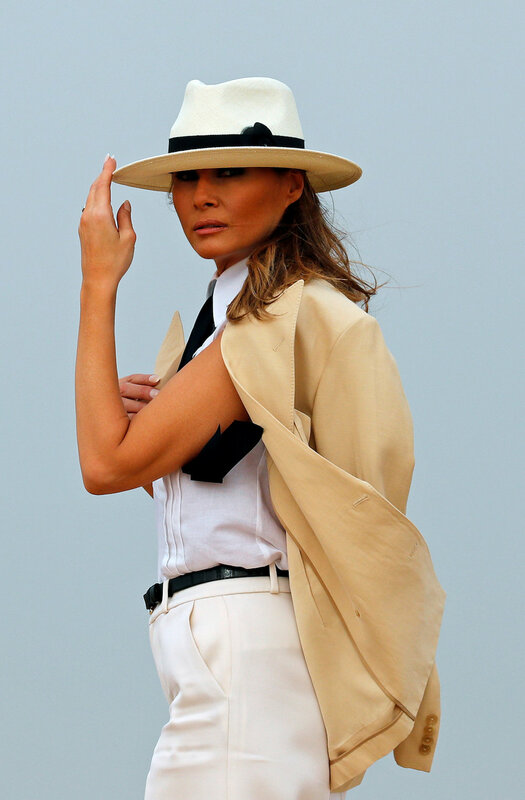 Her comments came after she received sharp criticism for wearing a white hat while in Kenya which some said related to the colonial period. The same style hat was used by European explorers in parts of Africa, Asia and the Middle East in the 19th century, and became a symbol of occupation. Trump’s visit was designed to promote her children's welfare programme.